2019 5th International Conference on Mechanical Structures and Smart Materials (5th ICMSSM2019) is sponsored by X-academy. And the conference will be held on May 27-28, 2019 in Xi'an, China. The aim of ICMSSM2019 is to provide a platform for researchers, engineers, and academicians, as well as industrial professionals, to present their research results and development activities in Mechanical Structures and Smart Materials Related Issue. Learn & build relationships with colleagues that are specialists in the same field; Share your experiences and lessons learned with other scholars and enthusiasts; Discover innovative solutions to enhance the performance; Discussion-oriented sessions and networking breaks to enable collaboration. If you are interested in being an invited speaker and share your ideas in the field of energy Engineering and environmental Engineering, you are welcome to contact us for any inquiry: cfp@icmssm.org and send us with your CV, speech title and abstract. 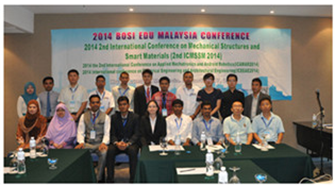 ICMSSM2014 has been successfully held in Kuala Lumpur, Malaysia. For more photo please click. 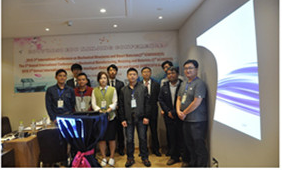 ICMSSM2016 has been successfully held in Nanjing, China. For more photo please click. 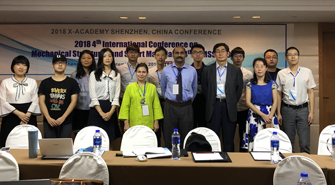 ICMSSM2018 has been successfully held in Nanjing, China. For more photo please click. to join in and work on the scientific and technical committees of the conferences. If you are interested in joining ICMSSM, please send proposal with your CV to. dedicates to organize worldwide academic conference.